(2) Some people urged more players to kneel or sit during the anthem at football stadiums on Sunday as a way to reinforce their First Amendment rights. Others urged more white players to stand with black players who have knelt or sat during the anthem. How confusing! White players are urged to stand metaphorically with their black teammates … by physically kneeling or sitting with them, or by speaking out afterwards. But how do we readers know that "stand with" in (2) is metaphorical? Why couldn't the second sentence be about white players standing physically? It happens that nearly all white players have continued to stand during the anthem. So it would be strange to urge "more" of them to stand, rather than urging "the rest" to stand or asking "the few sitters" to "resume standing." The "sinking" is again metaphorical. 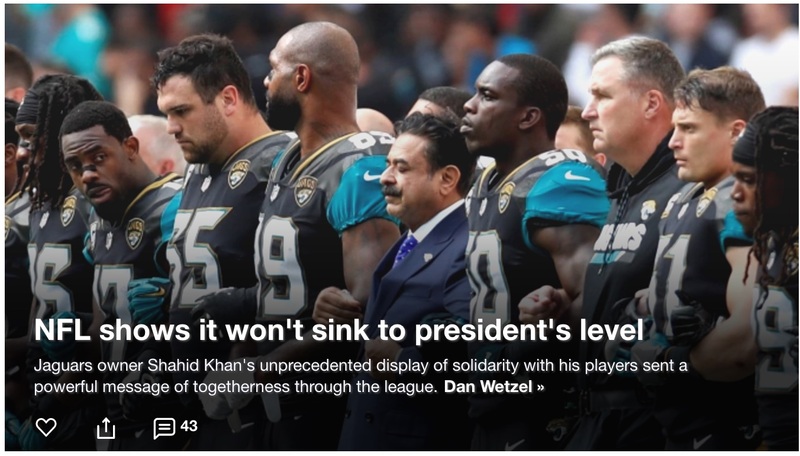 This time, the headline happens to be literally true as well: the president is presumably sitting as part of the TV audience, and the National Football League players are standing, not sinking physically to his level. Yet again, no one who knows the context could think that the headline literally means "NFL shows it won't sit or kneel." Why? "Sink to the president's level" is too roundabout a way to say "sit or kneel." "NFL shows it won't sit or kneel" isn't true: sitting and kneeling during the anthem are on the increase in the NFL. "These NFLers show they won't sit or kneel" still wouldn't be plausible as a choice for this headline. While the photo does show that they have decided not to go as far as kneeling, the newsworthy bit is that they are nonetheless protesting and their team's owner has joined them. Getting computers to attend to all these factors, as we humans seem to, is why passing the Turing test will be hard. Thank you for highlighting this! I read that entire piece this morning on the way to work and never once experienced any failure of understanding or even any temporary dissonance (no "What – haha! They're saying you should 'stand' with those who 'knelt'? Crazy!" or anything similar). It makes me think that there must be some fixed phrases involved: for example, while "sink to [someone's] level" is common enough, I don't think "kneel to [someone's] level" exists. Likewise, "rise to the occasion" vs the [I believe] nonexistent "stand up to the occasion"
Apologies for "contraphor" — that's one of those Latin+Greek mishmashes, isn't it? I know that crosses a line. Still, there's something about contra- that seems more appropriate here than anti-. In an effort to make the expression metaphorical itself, I'll suggest capsized metaphor. This post has echoes of the recent LL discussion of ambiguous noun phrases. Somewhere in the unconscious during the decoding of incoming texts there must be a a phase that sorts out the conflicts and ambiguities. When you hear a sentence starting “They must stand with …” both the material and the abstract interpretation must be hovering nearby. Yet consciously we are never delayed or hindered (unless we are language nerds). Comprehension is unbroken. This is a matter of great wonder. A wicked metaphor, or a sick metaphor, perhaps? Take the name literally and it's bad. I personally like the name "mismetaphor", as an echo of "mixed metaphor". "Trump turning football into a political football is very challenging for the metaphor sector." Don't have a clever suggestion for contradicting-the -literal-meaning metaphor, just want to remind that the usual source of them are actions of Rosa Park (and others, of course) who stood up by sitting. There is apparently a brain region that handles metaphors. I ran across a reference some years ago to a study of several patients with brain damage to a specific area who literally couldn't understand certain metaphors. The key metaphor I remember was "all that glitters is not gold." To capitalize on the confusing aspect, I'd suggest semiphor: phrase is interpreted half metaphorically and half literally. My first thought was also contraphor, as suggested above. I still like it too. Other options are antonymaphor (cumbersome? ), antonyphor, metantophor, or metantonym. In working on anti-racist materials for a local community organization, I'd been using metaphors about "standing with" people of color and "standing up for" social justice until one of my colleagues mentioned that those expressions can be considered "ablist" in that they tacitly exclude people in wheelchairs, for example. So now I try to remember to use metaphors like "showing up for" social justice and "supporting" people of color instead. TIme for people of good will to sit down and be counted! Orchestral musicians also take a stand by sitting down. If you don't insist on clever, there's "incongruous metaphor". Personally, I never metaphor I didn't like. While I'm at it, these seem to be a subclass of what used to be called bulls or Irish bulls. They seem to be a higher percentage of Goldwyn-isms than Berra-isms. How about malaphor, to go with malamanteaus? There's a separate complication here (that may spill over into the metaphors) of the blurry distinction between action and inaction and/or what's the default/unmarked versus marked option in the situation. The players here (the ones certain politicians are upset about) aren't "refusing to rise" — that's more the situation of any sympathetic fans in the stands who were already sitting down but are conventionally expected to stand up for the anthem. When you walk out onto a football field you are already standing and by default will remain that way unless you take some action to change that. Thus variants of "take a knee" are trending on social media etc in order to provide a positive (and active) characterization for what the players in question are doing, perhaps ironically so given that the core football sense of taking a knee (the quarterback deliberately doing so in order to run out the clock at the end of the game and protect a lead w/o risk of fumbling or otherwise worsening the situation) is probably the single least heroic conventionally-acceptable thing a football player can do while in uniform. Inaction/stasis/continuity-of-the-status-quo can of course be heroic in the right circumstances (it's what Rosa Parks did – her seat on the bus had been a conventionally okay one for black passengers at the time she sat down in it; she just refused to move when the driver reclassified that seat partway through her trip), but it's not what's going on here. "all that glitters is not gold" has always bothered me. Wouldn't it correctly be "not all that glitters is gold"? Not to mention a direct quote, and in meter. But I wonder if the brain-damaged patients John Roth mentions weren't defeated by the syntax rather than the metaphor. Nor all, that glisters, gold. "[…] Cooper never sat, his acathisia was deep-seated and of long standing." @ajay: Thank you for leading me to that delightful, if tragic, poem. @phillip : I am not obligated to cast the phrase in amber. Language changes, including so-called "set" phrases. * Evidently the phrase is not so fixed that Gray couldn't change Shakespeare's "glitters" (from The Merchant of Venice) to "glisters." * I wasn't able to find a phrase that changed in wording but "a close shave" apparently used to mean "miserly" so it's safe to say that phrases do change. Hmm, Wikipedia claims Shakespeare used "glisters" while MIT uses "glitters." And that said, Chaucer fronts the "not" as I suggest. Actually, this discussion of "all that glitters is not gold" versus "not all that glitters is gold" comes up a lot, and others have taken the latter path.